RoanokeAfter5 Loves MUSIC! Stay after the Happy Hour on Feb 26th to Enjoy! Home → Events → RoanokeAfter5 Loves MUSIC! Stay after the Happy Hour on Feb 26th to Enjoy! RoanokeAfter5 has been very honored to be associated with Basham Entertainment for our recent events, and even more so now with some fantastic Texas Music artists performing afterward! 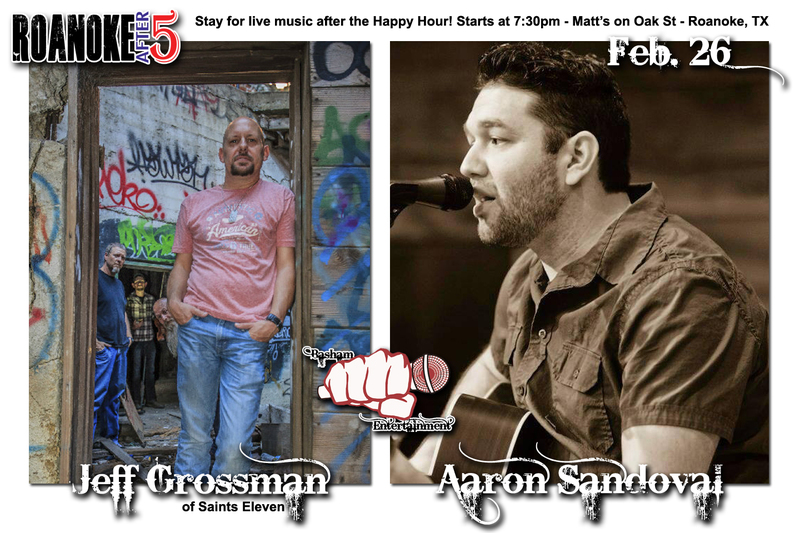 This month on Feb 26th, we are pleased to announce Jeff Grossman of Saints Eleven and Aaron Sandoval will both be on board for a great live performance at Matt’s on Oak Street in Roanoke! Networking at 5:30, music starts at 7:30. We will see you there!